NephMadness 2015: What did the people say? One of the tensions in NephMadness is how to decide the winners for each contest. Last year, Matt and Joel scripted every result. We were quite happy with the results but many people complained about the process. One option that was repeatedly suggested was to let the people vote. We decided not to do that, but we do have that information. We tip our collective hat to the wisdom of the crowd. The closest match was Vanco vs Pip/Tazo 172 to 170 with the edge to vanco. Sweet Pee: Do SGLT2 Inhibitors Prevent and/or Slow the Progression of Diabetic Kidney Disease? Portable and Implantable Artificial Kidneys: AWAK, WAK, and IAK, oh my! Renal Infarction: What to Look For and How to Treat? Dialysis and Heparin: What’s the Evidence? 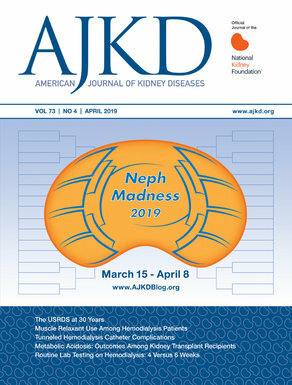 NephMadness 2019 Is A Wrap!